What is crepey skin? Crepey skin is skin that has become thinner, drier, and less elastic—similar in look and feel to crepe paper. Crepey skin is a natural result of aging that can appear all over the body, from under the eyes to the neck and chest. With age, our skin slowly loses the elastin and collagen that keeps the skin flexible and firm. The loose, and sometimes saggy, thin skin may be a source of self-consciousness. So, in this article, we discuss how to get rid of the crepey skin naturally, as well as the various causes and possible ways to treat it. Crepey Skin vs. Wrinkled Skin: Are They the Same? As you get older, your body produces less collagen. Collagen is the substance that helps sustain structure in the body’s tendons, cartilage, and skin. The lack of collagen causes the skin to lose some of its elasticity and firmness, which can result in crepey skin. The ultra-violet (UV) rays of the sun can cause the further breakdown of collagen along with a compound called elastin, which helps keep the skin tight. Again, this isn’t an instantaneous effect—it builds up over time. Part of what makes us human is how we move as individuals. How our eyes move, how the corner of our lips may turn when we smile, or how we might wring our hands in tense moments. Over the years, those movements can contribute to stretching of the skin in spots that may eventually become crepey. Weight gain and weight loss, perhaps surprisingly, can have the same consequences when it comes to crepey skin. Gaining weight will stretch the skin, and can sometimes damage the fibers that hold the skin tight. When weight is lost, sometimes the skin doesn’t snap back, especially if the loss is dramatic. This can all contribute to the development of crepey skin at any stage in life. This inescapable force of nature pulls down on all of us each day, and eventually has consequences on our body. Gravity can affect your joints, muscles, back, and skin. 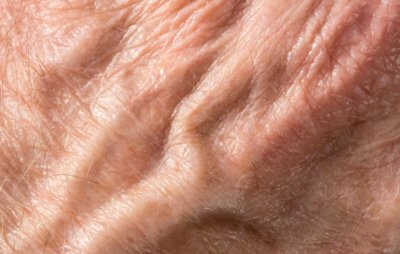 It is part of the reason why your skin droops downward in old age. Combined with each of the factors above, gravity is also a contributing factor to crepey skin. Many of our lifestyle choices and habits have damaging effects on our skin. Most are aware of the more serious risks of smoking, like lung and oral cancers and heart disease. But cigarette smoke, in particular, has also been shown to prematurely age the skin. Studies indicate that the chemicals in tobacco smoke block collagen production and increase production of enzymes that degrade proteins and promote elastosis (the yellowing and thickening of skin due to sun damage). This can all contribute to crepey skin. Some dermatologists believe that your preferred method of sleeping may also contribute to crepey skin. Side-sleeping presses your face, neck, and shoulders against the pillow, pushing your skin against the creases and possibly etching wrinkles into these areas over hours of sleeping, according to Cleveland Clinic dermatologist Melissa Piliang. The doctor recommends sleeping on your back instead to avoid the cumulative effects, which could lead to crepey skin. Drinking plenty of water is necessary to maintain good health overall, but in this case, it is all about the skin. Drinking lots of water can help keep your skin moisturized and supple, and help give it a little more elasticity. Consistently dry skin has the tendency to crack, wrinkle, and become damaged, which can lead to crepey skin in those areas. If you notice your skin becoming dry, drink more water. Adding vitamin C to your system via diet or oral supplement could also help with crepey skin. Vitamin C is an essential nutrient for the formation of collagen in your skin. Increasing your daily intake can help boost collagen production, potentially tightening up the skin and removing some of the crepey effects. Sufficient vitamin E intake has a similar end result, but for different reasons. Vitamin E works as an antioxidant, and could possibly destroy the free radicals that cause skin damage and help to repair them. UV ray damage, in particular, may be reduced by vitamin E.
So, taking vitamin E orally could help eliminate some of the environmental contributors to crepey skin as well as help repair the damage and promote collagen production, which could firm up and tighten the skin. Aloe vera is commonly used to help repair the skin from damaging effects like burns and allergic reactions, but it could also help you repair crepey skin. The plant contains a large amount of vitamins and compounds that can address crepey skin, including vitamins C, E, and B12 and a host of antioxidants. These substances could help reverse some of the skin’s damage by boosting collagen in the skin. This may not only stop crepey skin, but may also even prevent it from occurring. Avocado oil is another natural remedy that contains a number of vitamins and compounds that could help repair crepey skin. It contains beta carotene, protein, lecithin, fatty acids, and vitamins A, D, and E, which could all help moisturize the skin and protect it from UV rays. This combination also works by helping to boost collagen production in the skin, repairing and keeping away crepey skin. This cold-pressed oil from the rosehip seed contains large amounts of vitamin A and vitamin C, which could work as an all-natural one-two punch on crepey skin. As mentioned, vitamin C could help boost collagen production, which helps firm and tighten skin. Vitamin A can penetrate the skin, helping to form a protective barrier from oxidative damage. Vitamin A can also help keep your skin moisturized, and promotes collagen formation. It’s a perfect combination for reversing the effects of crepey skin. We’ve discussed natural techniques for getting rid of crepey skin, but most just want to know how to prevent crepey skin from developing in the first place. Currently, there is no surefire way to prevent crepey skin from ever happening to you. The effects of aging, sunlight, environmental pollution, and gravity on your skin are constant and cumulative. However, there are steps you can take to protect your skin, and extend its youthful firmness and elasticity for as long as time will allow. In the previous section, we discussed the importance of drinking plenty of water for keeping your skin moisturized and supple. There are also countless cleansers, moisturizers, and body lotions on the market meant to replace the nutrients lost from the skin due to aging. Choose products with hydroxy acids that will help exfoliate and remove dead skin, anti-oxidants that stimulate collagen production, and retinol in particular is believed to help repair damaged skin tissue. One of the main culprits behind crepey skin is damage from the sun, specifically UV rays. Protect yourself from them. If you’re going to be out in the sun all day, use sun screen of an appropriate SPF factor. Wear a hat, and cover up your skin. Crepey skin vs. wrinkled skin. What exactly is the difference? Both come with age and both are similar in appearance. The main difference between the two is lies in the respective causes. While crepey skin is caused by several issues, the main is a lack of collagen, which promotes the absence of structure and firmness. Old age wrinkles are primarily the result of repetitive movements. You earn the wrinkles with your day-to-day actions, gestures, and even sleeping arrangements. These create lines in your body, but the affected skin typically remains somewhat tight. One of the ways to stay on top of crepey skin is to eat foods that promote healthy skin in general. Properly nourished skin is better able to withstand the internal and external factors that lead to thinning, crepey skin. Here are a few tips for food for healthier skin. • Add more fruits and vegetables to your diet that are high in vitamins and antioxidants like blueberries, kiwis, bananas, kale, and spinach. • Adding foods that are rich in healthy fats like omega-3s can also help keep your skin moisturized and protect it from UV rays. Foods like salmon are great this and are good for your diet. • Avoid drinks that contain caffeine such as coffee and soda pop, as they can dry out your skin making it susceptible to damage. • Green tea contains a polyphenol antioxidant called EGCG. EGCG is thought to be a great antioxidant for preventing damage from UV rays. You can gain these benefits by drinking the tea or applying a warm tea bag to the body. • Low-fat dairy yogurt tends to be a great source of vitamin A, which as noted above, helps in the creation and promotion of collagen. • Dark chocolate is filled with flavonoid antioxidants that work well at protecting the skin from UV ray damage. • Whole grains tend to contain nutrients like folate and niacin, and micronutrients like zinc and magnesium, all of which can contribute to the overall health of the skin. You may be wondering what the big deal about crepey skin is anyway. Crepey skin poses no serious health risk nor is it a risk factor of a severe health condition. Humans have survived for thousands of years with crepey skin as just another part of aging. That being said, in a society that values youth, the appearance of loose, sagging skin can be uncomfortable for many individuals. It is a prominent marker of age, as the skin loses collagen and elastin—and therefore firmness and elasticity—with time. There are ways to shield your skin from the effects of aging, to delay the onset and abundance of crepey skin. Keeping your skin moisturized with water and creams, maintaining a healthy and balanced diet, and avoiding the harmful rays of the sun are simple and inexpensive methods. At the end of the day, we all age. But, how well we age, is, in part, up to us. “Crepey Skin Vs. Wrinkles: What’s The Difference & How To Avoid,”Beverly Hill MD, August 17, 2017, http://beverlyhillsmd.com/crepey-skin/, last accessed August 29, 2017. Ferreira, M., “Causes of and Treatments for Crepey Skin,” Healthline, July 11, 2017, http://www.healthline.com/health/crepey-skin#overview1, last accessed August 29, 2017. Werman, M., et al.,“The effect of various avocado oils on skin collagen metabolism,” Department of Food Engineering and Biotechnology, Technion-Israel Institute of Technology, 1991; 26(1-2):1-10; https://www.ncbi.nlm.nih.gov/pubmed/1676360, last accessed August 29, 2017. Surjushe, A., et al., “Aloe Vera: A Short Review,” Indian Journal of Dermatology, 2008; 53(4): 163–166; https://www.ncbi.nlm.nih.gov/pmc/articles/PMC2763764/, last accessed August 29, 2017. Yates, A., “What Causes Crepey Skin and How It’s Different From Wrinkles,” Hiya, July 5, 2017, http://www.highya.com/articles-guides/what-causes-crepey-skin-and-how-it-is-different-from-wrinkles, last accessed August 29, 2017. Kiefer, D., “10 Foods for Healthy Skin,” Healthline, April 17, 2013, http://www.healthline.com/health-slideshow/foods-for-healthy-skin#1, last accessed August 29, 2017. Morita, A., “Tobacco smoke causes premature skin aging,” Journal of Dermatological Science, Dec. 2007; 48(3):169-75; DOI: http://dx.doi.org/10.1016/j.jdermsci.2007.06.015, last accessed August 29, 2017.